We haven’t written much recently about Jeremy Corbyn, the leader of Britain’s Labour Party. In 2015, as he was campaigning for Labour leader, we covered his sordid history, Likely British Labour leader’s creepy associations, including Holocaust deniers, anti-Semites, Jihadist preachers, BDS and Max Blumenthal, among others. Politically, Corbyn comes from the vicious strain of left-wing European politics that views surrender to Islamism as the highest expression of political correctness, and which couches its anti-Semitism in the rhetoric of anti-Zionism and anti-Israelism. A memorial wreath in his hand, Jeremy Corbyn stands feet from the graves of terror leaders linked to the Munich Massacre. The picture was among a number taken during a service to honour Palestinian ‘martyrs’. Buried in the cemetery in Tunisia are members of Black September, the terror group which massacred 11 Israeli athletes at the 1972 Olympics. One picture places Mr Corbyn close to the grave of another terrorist, Atef Bseiso, intelligence chief of the Palestine Liberation Organisation. Bseiso has also been linked to the Munich atrocity. Another image shows the Labour leader apparently joining in an Islamic prayer while by the graves. Last night sources close to Mr Corbyn insisted he was at the service in 2014 to commemorate 47 Palestinians killed in an Israeli air strike on a Tunisian PLO base in 1985. UK Labour leader Jeremy Corbyn on Saturday faced fresh criticism over photos of him holding a wreath during a 2014 ceremony at a Tunisian cemetery. 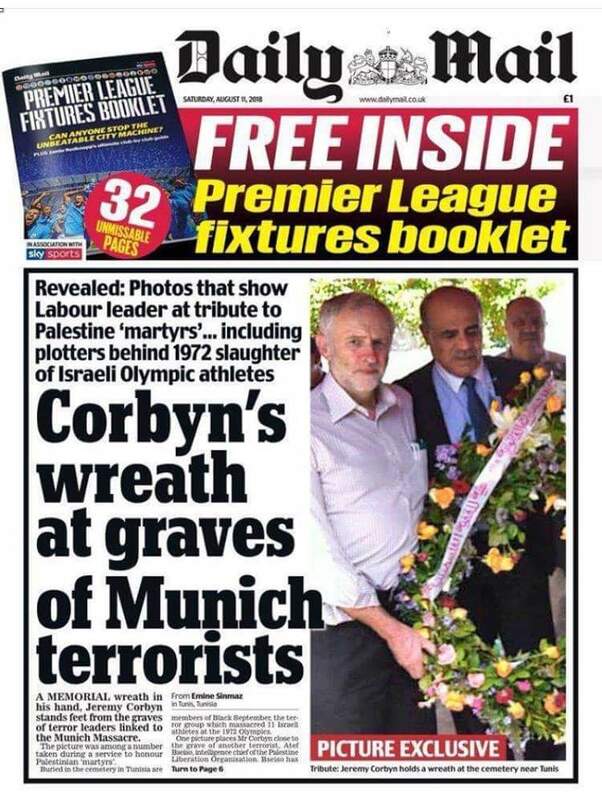 It appears from the snapshots that Corbyn was standing near the graves of Palestinian terrorists involved in the massacre of 11 Israeli athletes at the Munich Olympics in 1972. In 2017, the Sunday Times revealed that in an October 2014 article published on the radical left-wing website Morning Star, Corbyn recalled a visit to Tunisia where he marked the anniversary of Israel’s 1985 attack on the Palestine Liberation Organization’s headquarters there, laying wreaths at a cemetery commemorating Palestinians said killed by Israeli forces in various incidents. 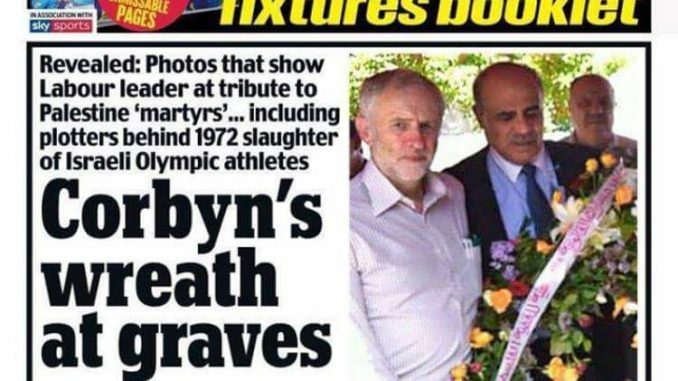 Pictures published by the Daily Mail Saturday appear to show Corbyn in front of a plaque honoring members of the Black September terrorist organization, 15 yards (approximately 13 meters) away from the graves of those killed in the 1985 air strike. One image, said to be from the archives of the Palestinian embassy in Tunisia, seems to show the leader of the UK opposition participating in Islamic prayer. The American sanctions on Iran went into effect this week and a large number of companies stopped doing business with Iran so as not to lose their permission to continue to be active in America’s economy. The sanctions will turn more severe in three months time and will include banks and energy industries, with the result that Iran will lose much of its income, the major part of which stems from oil, gas and related products. It seems that only China intends to continue its regular – or almost regular – economic ties with Iran and Russia, too,will probably not entirely halt its economic ties with the Ayatollah regime. 1. President Trump will continue to pressure Iran in every conceivable economic way and that US pressure will bring the Iranian economy to its knees and possibly to a state of total collapse. 2. If Iran does not engage in armed violence, Trump will refrain from military action as well. If Iran employs military measures against sea travel in international waters – the Straits of Hormuz and Bab el Mandeb – the US armed forces will strike Iran mercilessly. 3. President Trump will get even with Iran if it uses “proxies” in order to attack American interests. 4. Iran will attempt to get through the coming two and a half years quietly, hoping that Trump is to be defeated and followed by a Democratic president who will reinstate the nuclear agreement and remove the sanctions. 5. European leaders will continue to support Iran with words, but they will not be able to force European industries to do business with Iran. 6. European leaders are worried that Iran’s regime will collapse and lead to general chaos, with everyone fighting everyone else and a new wave of millions of immigrants attempting to reach Europe. That is the reason Europe’s leaders are trying to resuscitate the Iranian regime in every way they can. Imagine There’s No Terror. It’s Easy if You Try. The Journal report explained that given recent Iranian-directed terror attacks and attempts on European soil — most recently a foiled plot to bomb a meeting of an opposition group in Paris — the United States was pushing its European allies, notably the United Kingdom, France and Germany, to distance themselves from the nuclear deal. The Europeans though, despite the evidence of Iran’s malign activities, believe that the deal will enhance their security. The security official quoted also demonstrated a reluctance of the Europeans to hold Iran’s regime responsible for the terror attempts. But the assertion that a recent terror attack targeting an Iranian opposition group in June was the work of rogue elements in the regime ignores Iran’s record of decades of state-sponsored terror on foreign soil. In fact, an “assessment” of Iran’s record would yield a more sobering conclusion than what the quoted security official imagined. “I worry,” Walter Cronkite said, “that we’re not getting enough of the news to make us informed citizens.” Looking at recent coverage of the United Nations Relief and Works Agency (UNRWA), the famed broadcast journalist’s concerns seem justified. Recent reports by Foreign Policy Magazine and The Washington Post, among others, whitewash troubling aspects of UNRWA’s history. UNRWA was created in 1949, following the unsuccessful attempt by several Arab states to destroy Israel. UNRWA is the only U.N. organization whose stated mission is to assist a specific group of refugees, Palestinian Arabs. All other refugee populations in the world fall under the jurisdiction of the United Nations High Commissioner for Refugees (UNHCR). This is but one of several ways in which “Palestinian refugees” are treated—and categorized—in a completely different manner from other refugees. As Cliff Smith, an analyst with the Middle East Forum, a Philadelphia-based think tank, highlighted: UNRWA’s peculiar definition of “refugee” includes people who are “generations removed from the conflict, people who are citizens of new states, and people who are in their internationally recognized home of the West Bank and Gaza.” UNRWA’s categorization of “refugee” is not dependent on need and also applies to citizens of recognized states. As the Committee for Accuracy in Middle East Reporting in America (CAMERA) has noted, according to UNRWA’s spurious definition, the twenty-year old, Los Angeles-born millionaire fashion model, Bella Hadid, is considered a “refugee” to a seventy-year old event that occurred after Arab countries rejected a U.N. plan for a Jewish state and an Arab state, opting for war instead. A large incendiary kite launched from Gaza landed on power lines near Kibbutz Sufa, sparking a quick operation by employees from the Israeli Electric Corporation to remove the device before a fire was started. The 4-meter (about 13-foot) kite, which landed on Friday, caused a power outage at the kibbutz and in the surrounding area. It was removed from the high-voltage wires by electric company workers using a crane. The IEC released pictures of the kite on Saturday. In another community near the Gaza Strip, police sappers neutralized an incendiary balloon flown over from the Hamas-run Palestinian enclave that landed next to a dining room in an Israeli community in the Eshkol Region. In response, the Israeli military on Saturday afternoon said it targeted a cell responsible for launching incendiary balloons in the northern Gaza Strip. Reports in Palestinian media said two people were injured in the Israeli strikes in El-Bureij. There were also Palestinian reports of a second IDF strike elsewhere in the Gaza Strip. Today, HonestReporting Canada (HRC) filed a complaint with the Canadian Broadcast Standards Council (CBSC) after CTV National News aired a report last night, August 9, which wrongly claimed that Israel destroyed a Gaza cultural centre, whereas Israel contends the building was Hamas’ headquarters used for military and terror purposes. On behalf of our 30,000 subscribers, we called on CTV National News to issue an on-air corrective to remedy the erroneous and misleading statement it broadcast. Hamas arrested a Salafi cell in Gaza due to suspicion that it is responsible for the launch of a Grad missile towards Beersheba, which they believe lead to the unplanned, severe deterioration in the last round of violence on Thursday. At the end of this last round, the IAF destroyed a multi-story building in Gaza town. Ma’ariv was notified that since the missile launch at the Negev’s capital, Hamas opened an intense investigation in order to discover who is responsible for the missile launch. Today, it became known that members of the cell have been arrested, around three to four suspects. The cell’s organization has not been announced in suspicion that they are responsible for the launch. The source from the Strip stressed that it has not been made clear which organization the cell belongs to and that they are checking the suspicion that the members of the cell “are used by Israeli agents.” With that, the possibility that it is a revenge attack by Hamas is not dismissed because the members of the Salafi organization are being chased by security forces of Hamas in the Gaza Strip and they are often arrested by them. If Malm was unable to travel southern Israel to see for herself the damage, to visit the wounded, and to meet the children attending day camps in bomb shelters, she could have availed herself to the plentiful visual documentation of the 180 rocket and mortar attacks. Indeed, one such image, a dramatic Reuters photograph depicting the Iron Dome intercepting one of the incoming rockets, accompanied Malm’s story. A yearly hot air balloon festival scheduled to take place in the Besor National Park in the Negev Desert was cancelled on Thursday, following a barrage of rockets into Israel from Gaza overnight on Wednesday. The park is located approximately nine miles from the Gaza border and had sold 4,000 tickets to the festival, which had been in stages of preparation for months. Financial losses to tourism as a result of the stream of rocket fire are estimated in the millions of shekels. The Shikma Beshur Tourism Association announced that card-holders could either choose to receive a full refund, or to give the price of their tickets to organizations helping the residents of southern Israel. “We will continue to wave the Israeli flag and sing Hatikvah with great pride,” he wrote, posted alongside a video of protesters waving the Palestinian flag. Saturday night’s protest drew a crowd of more than 10,000 people, primarily Arab-Israelis, as they protested the recently-passed Nation State Law, the second-such protest in as many weeks after the Druze-led protest last weekend. The Jewish Nation-State Law cements a right to self-determination in the State of Israel for the Jewish people, and addresses this in regards to language, flag, state symbols, holidays, and the status of the Jewish diaspora. Much of the criticism against it stems from the fact that it does not mention the value of equal individual rights for all citizens. The protest was organized by the Higher Arab Monitoring Committee, a non-governmental umbrella organization that represents Israel’s Arab community in the political sphere. Earlier in the week, the committee submitted a formal petition to the High Court against the law on Tuesday before announcing Saturday’s protest. The petition alleged the Nation-State Law discriminates against non-Jews, primarily Israel’s Arab minority, whose numbers make up around 20 percent of the state’s population. The head of the Simon Wiesenthal Center’s Jerusalem office, Dr. Efraim Zuroff, on Thursday meted out scathing criticism at the executive board of the German Left party for blaming only the Jewish state in its resolution against IDF measures in the Hamas-controlled Gaza Strip. The anti-Israel resolution is part of the “antisemitic, anti-Zionist elements” of the German Left and is “fulfilling a long tradition of hatred of Jews,” Zuroff told The Jerusalem Post in a telephone interview. “I would like to see if Germany were in the same situation. I am fairly certain they would respond in the same way as Israel, or more severely, if civilian targets were under fire by dozens of missiles,” Zuroff said. Yusuf al-Mahmoud, a spokesman for the PA cabinet, urged the international community to act and pressure Israel to force it to cancel a decision to shut down the Cave of the Patriarchs in Hevron to Muslims for 24 hours starting Wednesday night. He argued that the “occupation’s” continued harm to the holy sites was intended to ignite a religious war that would be similar to the sectarian and religious wars that “colonized” the region. The fleet of some 40 boats turned back to Gaza after the warning shots were fired. Saturday’s flotilla was part of the Hamas-led “March of Return” protests, which organizers said was aimed at highlighting the importance of lifting the blockade on the Strip, a provision outlined in a ceasefire agreement between Israel and Hamas currently under negotiation. “It sends a message to the Palestinian factions involved in the negotiating the ceasefire agreement that we will not agree to any solution that does not include lifting the blockade on the Gaza Strip,” organizers said, according to the Ynet news site, just before setting sail. 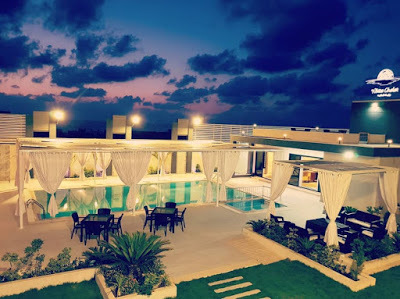 A new luxury resort, the White Chalet, has opened up in Gaza. It features lush manicured lawns, a volleyball court, a swimming pool, and stunning architecture. Since the establishment of the Gaza Reconstruction Mechanism (GRM), over 6.5 million tons of construction materials have entered into the Gaza Strip. These building materials have helped the development of the construction sector in the Gaza Strip, where more than 100,000 housing units have been refurbished or renovated, and another 10,000 new units are currently in various stages of construction. In spite of continued agression from Gaza, essential humanitarian aid and building supplies enter Gaza nearly every day. What is not diverted by the Iranian funded Hamas terror group is used to build homes, schools, civic infrastructure, and apparently luxury resorts. In recent years Egypt has been experiencing a severe economic crisis. This crisis came to a head in 2016, prompting the government to accept an IMF reform plan which involved eliminating subsidies and raising the cost of goods and services. As part of the reform, in June 2018 Egypt announced increases in electricity and water rates, fuel prices, and public transportation fares. The austerity measures sparked public fury in Egypt. Parties, opposition forces and social media activists harshly criticized the regime, holding it responsible for the crisis, and warned that the measures would harm the middle class and could cause unrest and mass demonstrations. These warnings were echoed by Egyptian journalists from across the political spectrum. In a bid to soften the impact of the austerity measures, the Egyptian government announced an increase in pay for various sectors as well as an expansion of social benefits for the low-income sectors. In addition, it launched a media campaign to explain and justify its actions, presenting encouraging economic data and urging the public not to heed what it referred to as vicious anti-government rumors being disseminated on social media. This report reviews various oppositionists’ and social activists’ furious reactions to the government’s austerity measures; the regime’s efforts to rebut the criticism; and warnings by Egyptian writers about a possible worsening of the situation. Satellite pictures released on Saturday by an Israeli intelligence site appeared to show the aftermath of an airstrike on an Iranian-run missile production facility in Syria last month, an operation which has been attributed to Israel. The facility, in Masyaf in northwestern Syria’s Hama province, was previously allegedly used to produce and store chemical weapons. It was run by Dr. Aziz Asbar, a top Syrian chemical weapons and rocket scientist, who was killed earlier this month when his car exploded in Masyaf. A senior official from a Middle East intelligence agency has pointed the finger at Israel’s Mossad for the alleged assassination, according to a New York Times report this week. According to that report, Israel believed that Asbar was leading a classified weapons development program called Sector 4 at the Syrian Scientific Studies and Research Center, and was busy re-building an underground weapons factory to replace the one said destroyed by Israel last year. 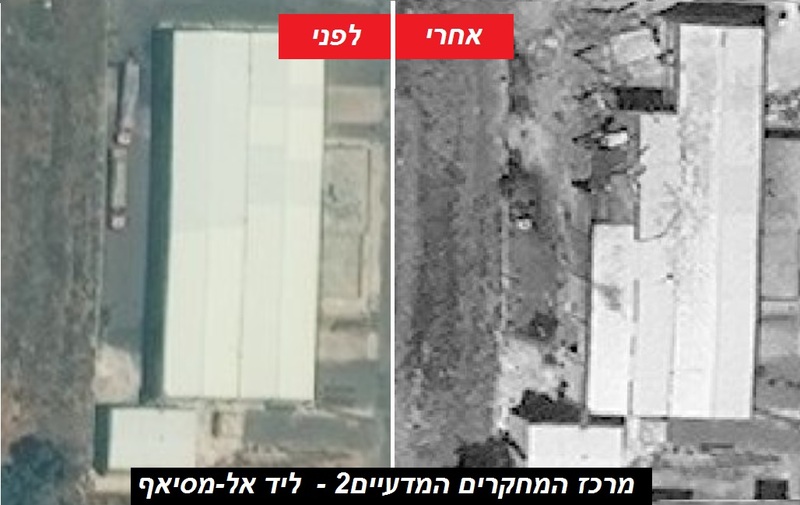 The satellite pictures were released Saturday by the Israeli website Intelli Times, and showed the facility both two days before the alleged attack on July 22 and in its aftermath. The facility was in charge of the production of the Syrian versions of Iran’s Fateh 110 surface-to-surface missiles, which have a range of approximately 200 km, according to the report. The Syrian army urged people in rebel-held Idlib province to agree to a return of state rule and told them the war was nearing its end in leaflets dropped over the northwestern region on Thursday. Idlib, at the Turkish border, is one of the last major rebel strongholds in Syria. President Bashar al-Assad, who has defeated rebels across much of Syria with Russian and Iranian help, has indicated it could be his next target. Syrians have fled to Idlib province from other parts of the country as the government has advanced, and the United Nations has warned that an offensive there could force 2.5 million people towards the Turkish border in the event of an offensive. NATO member Turkey has warned against any offensive in Idlib, and is pressing Russia to make sure this doesn’t happen. Turkey has established 12 military observation posts in the northwest under an agreement with Russia and Iran. Australia has stripped five Syria-based dual nationals of their citizenship due to their involvement with the Islamic State terrorist group, a government minister said Thursday. They join notorious Daesh fighter Khaled Sharrouf (pictured) — who made headlines when he posted a Twitter image of his young son holding a severed head — as the only nationals to be kicked out under tougher anti-terror laws. “I can confirm that five more individuals have ceased to be Australian citizens because of their involvement with Daesh offshore,” Mr. Dutton said in a statement. U.S. President Donald Trump said on Friday he had authorized higher tariffs on imports from Turkey, imposing a 20 percent duty on aluminum and a 50 percent duty on steel. Tension has been mounting between the two NATO allies over Ankara’s imprisonment of an evangelical pastor and other diplomatic issues. “Our relations with Turkey are not good at this time!”, he concluded. Meanwhile, Turkish President Recep Tayyip Erdogan called on the country’s citizens to sell foreign currencies to support the lira which has seen a record plunge against the US dollar. “Change the euros, the dollars and the gold that you are keeping beneath your pillows into lira at our banks. This is a domestic and national struggle,” Erdogan said, as quoted by the Associated Press. Yesh Atid party leader Yair Lapid applauded US President Donald Trump’s decision Friday to impose tariffs on Turkey, further pressuring that country’s troubled economy amid a diplomatic row with Washington. “I praise President Trump for his decisive action against [President Recep Tayyip] Erdogan and Turkey,” Lapid wrote on Twitter. Lapid said it “would not hurt the Netanyahu government” to also take action against Turkey, presumably due to Erdogan’s increasingly venomous statements against the Jewish state. The Yesh Atid MK has previously implored Prime Minister Benjamin Netanyahu to adopt a tougher stance toward Turkey and slammed as a “diplomatic mistake” the 2016 reconciliation deal between the countries. The agreement had restored ties heavily strained by the deadly 2010 raid on a Turkish ship trying to breach the blockade on the Gaza Strip. Israel maintains the blockade is necessary to prevent weapons reaching terror groups such as Hamas, which rules Gaza. The Labour Party’s war on the Jews grows more lunatic by the day. The Daily Telegraph reports that shadow chancellor John McDonnell gave a speech in 2012 in which he accused Israel of attempting a genocide of the Palestinian people in Gaza. According to the journalist responsible for the story, when Labour was contacted for a comment a party spokesman defended McDonnell’s charge as justifiable. The real story here is not that John McDonnell believes the Jewish state is engaged in the destruction of another people but that a Labour Party spokesperson, instead of saying ‘FFS, let me get back to you’, agreed with this assessment. Presented with McDonnell’s outrageous position, the Labour Party officially adopted it there and then and spun it to a reporter. Israel-haters delight in lobbing every obloquy imaginable at the Jewish state but genocide is a particular favourite. The reason is that the term was devised by a Polish Jew, Raphael Lemkin, whose entire family was wiped out in the Holocaust. Lemkin advanced the concept of genocide and drafted its definition in the wake of the Shoah to prevent another such exercise in racially-motivated mass murder. The origins of the term would not have been unknown to McDonnell. He is not a clever man but he’s not a stupid one either. A Palestinian school built with support from Brussels still bears the name of a mass-murdering terrorist and continues to display a plaque with the Belgian flag. The elementary school in the West Bank was gifted to the Palestinian Authority in 2013 and subsequently renamed in honor of Dalal Mughrabi — a Palestinian nationalist who in 1978 helped massacre 38 people, including 13 children, near Tel Aviv. A plaque displayed near the entrance of the school — whose logo includes a map erasing Israel — features the Belgian flag and identifies the Belgian government and the Belgian Development Agency as its backers. After the monitoring group Palestinian Media Watch (PMW) brought the institute to public attention last October, a spokesperson for the Belgian Foreign Ministry told The Algemeiner that the country would “not allow itself to be associated with the names of terrorists in any way” and has “immediately” raised the issue with the PA.
Belgian values “should be reflected in curricula taught at schools funded abroad by Belgian taxpayer’s contributions as well as in the names and logos of such schools,” the spokesperson said. The ministry also announced that it would suspend two projects related to the construction of Palestinian schools, amounting to 3.3 million euros. The director behind a new stage production of “The Diary of Anne Frank” explained on Monday his decision to cast mostly Hispanic actors in the play. Jewish director Stan Zimmerman, a former writer for the sitcom “Roseanne” during its original run, proclaimed during an interview on CNN, “As a Jew, I would never demean her story,” referring to Anne Frank, whose famous diary told the tale of a Jewish family living in hiding during the World War II Nazi occupation of the Netherlands. Al Jazeera propagates hatred. Is it also a Foreign Agent? Qatar’s flagship media network Al Jazeera continues to be a major exporter of hateful content against the Jewish people, Israel, and the United States. For this reason, it is particularly urgent for U.S. officials to evaluate the separate legal question of whether or not Al Jazeera should be required to register with the Justice Department as a foreign agent over to its extensive ties to the Qatari regime. This would be an important signal to potential consumers that Al Jazeera’s messages should be approached with greater caution. In November 2017, the U.S. Justice Department forced the broadcaster for Russia’s propaganda outlet RT to register as a foreign agent over its ties to the Russian government. Other foreign media outlets with less nefarious profiles, such as companies linked to South Korea and Japan’s public broadcasters, are also registered under the Foreign Agents Registration Act. FARA was passed in the lead-up to World War II in order to ensure greater transparency from entities that were spreading domestic propaganda on behalf of Nazi Germany. The standard for registration under FARA is basically whether or not an entity such as a media outlet seeks to influence U.S. public opinion or policy on behalf of a foreign political entity such as a government. Organizations or individuals that register under FARA have to declare their activities for public disclosure, and the label tips off the American public that such actors may have an ulterior motive for their work. It would not in any way censor Al Jazeera’s freedom of speech. How rich: Writing in the Toronto Sun today (see full letter appended below), Khaled Mouammar accuses Israel of human rights violations against Palestinians on the very day that Israel was on the receiving end of over 200 deadly rockets and mortar bombs fired at southern Israel by Palestinian terrorists, mainly from Hamas. This is the same Khaled Mouammar who as President of the Canada Arab Federation wanted Ottawa to remove Hamas and Hezbollah from a list of banned terror organizations claiming they were “legitimate political parties” and replacing them with the Israel Defense Forces. Mouammar outrageously claims that Israel “erased Judaism as a religion from the Jewish consciousness and replaced it with Zionism – a supremacist political ideology.” There’s no foundation to this assertion. Judaism continues to flourish and Zionism is the national movement for the return of the Jewish people to their homeland and the resumption of Jewish sovereignty in the Land of Israel. Of course, let’s be mindful that it was Mouammar who called former Immigration Minister Jason Kenney a “professional whore” for supporting Israel and let’s not forget that the Federal Court of Canada ruled that the Government of Canada acted reasonably in cutting funding to the Canada Arab Federation as it appeared to support terrorist acts. A court ordered an ice cream factory in Russia to change its “poor Jew” brand because it is offensive. The Naberezhnye Chelny city court ruled against the Slavitsa company earlier this week, the news site Chelny-Biz reported Wednesday. The regional prosecutor, Alexander Evgrafov, had launched proceedings against the factory for discriminatory speech in March following protests by the local Jewish community. 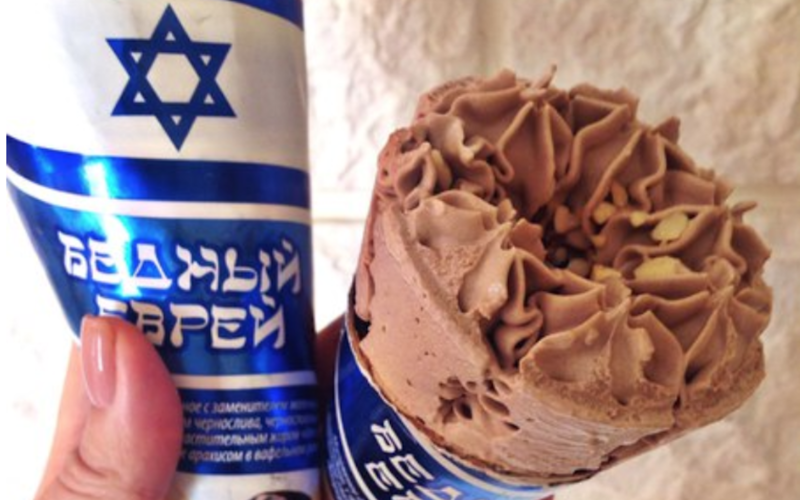 The ice cream cone, announced in February by the factory, which is situated 600 miles east of Moscow, is wrapped in an image of Israel’s flag. In court, Slavica’s lawyer recalled that the phrase “poor Jew” had been used in the past by other manufacturers and is widely known as the name of a local baked tart sold by the firm Karibe. The phrase also was used as the name of alcohol products produced by Taiga-Vostok. He also maintained it is a registered trademark belonging to Slavica and therefore is protected. The prosecutor argued the phrase was not known well enough to justify its use in commerce and cited the offense it caused the Jewish community.